Most used and demo saddles are featured on the new saddle pages. Please visit for more information. By taking a saddle on trial you agree to the trial policies listed on this website. Please note prices are subject to change. Credit card payments may be subject to additional service fees. 17.5" MW Custom made for MVVS! Built on the Baroque tree with calf skirt inlay, seat and pad, blue patent welting and blue stitching. monoflap dressage saddle with pig printed flap and skirt, black and white patent details and a sunny embossed leather cantle panel. 17.5" MW Monoflap black with black stingray, patent and crystal details. 18' WIDE Calf Covered Nut with darker brown and brown patent details. Special squared cantle. Black with subtle green and patent details. memal leather skirt and flap, calf seat and blocks. 17.5" XW Unique GPD made on the Baroque tree. Customized with calf covered skirt and flap and black mock croc cantle. T8 dressage saddle in black. This is the best bang for the money in an adjustable saddle. Synthetic but elegant flap and skirt with soft leather seat and pads. 17" High wither, 17" and 17.5" standard profile. 17.5" black. A great option for a shorter backed wider horse. SOLD 18" wide in black with red accents. SOLD 17.5" templated saddle. Measures like a MW. Used but in good shape! Front wither gussets and white welt. A nice saddle for a horse with some wither. SOLD 18.5" This very unique saddle has a number of upgrades including a suede seat for security, added rings for long trail rides and packs, serge K panels and the Classic Dressage Tree that is the seat/tree of the eloquence. 18" M, Has wither gussets and K panels. Built on a slightly dippier tree to accommodate more wither contour. Has a narrow twist (one of the most narrow you will find in a dressage saddle.) Built with vintage leather and in excellent demo/used condition. Perfect for your average to narrow thoroughbred influenced sport horse! 17.5" Wide Covered with dove welt and rear facing, lead patent cantle insert and silver stitch. 17.5" templated saddle that measures just narrow of wide. In great lightly used nearly demo condition. 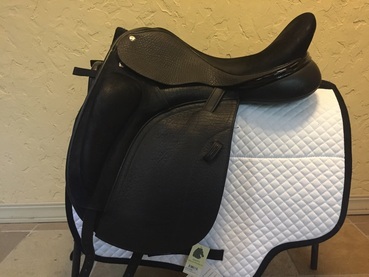 17.5" templated saddle in nearly new condition. measures pretty true to wide. Dark brown. 17" Black on the adjustable simmatrte. Made with rings to carry packs for long trail rides or endurance work. Used and custom built saddle combining features of both the molineux and the legacy saddles. SOLD 17.5" MW brown memel with nubuck seat and pad, brown patent cantle panel, blue patent welting and rear facing. SOLD !7.5" MW black Adam Ellis Style. Ordered with wither gussets, black patent cantle panel and diamante cantle detail. SOLD 18" Medium+. This saddle is a modern twist on the eloquence. Has attractive stitching and external knee block built on the eloquence tree. This saddle has been customized with a K panel, front wither gussets and subtle yet attractive black patent welt. Would fit a finer boned sport horse or thoroughbred shaped horse. Made with long wearing standard hide on skirt and flap. SOLD Lightly used 17.5" Med Wide Elegance Deluxe. The most popular dressage saddle made by Frank Baines. This model is lightly used and has been a demo most of its life. Comes with the Deluxe package moulded knee pads for that modern look and instantly broken in feel. Soft paded seat and traditional styling. ​18" 4W (XXW) Omni Low head saddle. This beautiful saddle is a custom order and is fully calf covered with patent details (patent rear facing, welt and cantle panel). A beautiful saddle perfect for the broad horse. ​17.5" wide with gussets. In very good Demo like condition with moulded pad and comfortable deep seat. Suits a thoroughbred influenced warmblood well - also suits shorter backs!